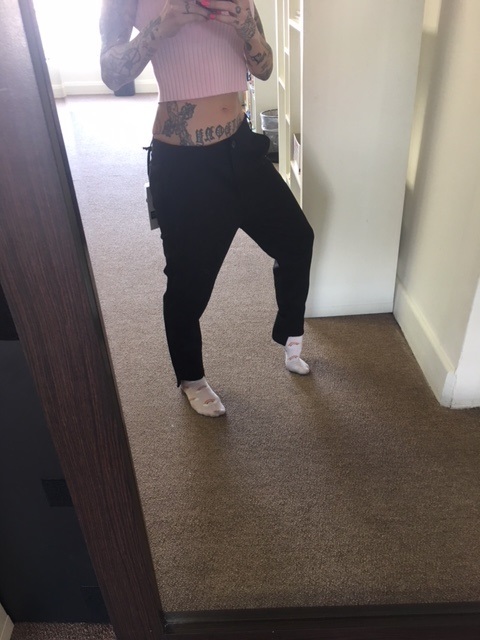 "The quality of these trousers is amazing and I just love the way these slouchy joggers hang low on my hips, I am wearing a size 26 instead of my usual size 25 because I prefer a more exaggerated slouchy fit. If I were to wear my true size 25 then these would fit more so how pictured on the model. If you want to minimize the slouchy fit then you would want to go down about 2 sizes depending on your personal preference. " I ordered these cute pants in a size 25. I have 7 pair of James Jeans and shorts all in a 25 and they fit great! These arrived yesterday and they are huge! The waistband is the smallest part of the pant and it measures 30 inches. The hips measure 38 inches. I love James Jeans but I am going to stick to jeans and nor order pants from now on.